"We would float between plaid flannel and rock 'n roll to silks and bedazzled bindis." 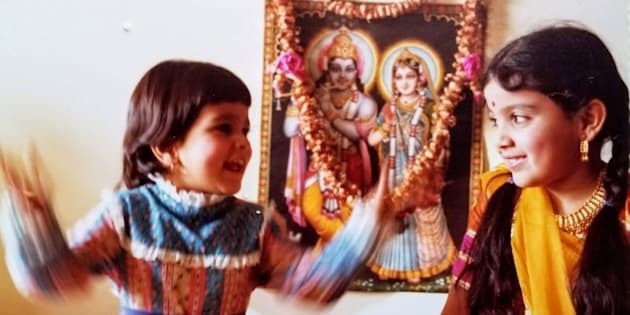 Henna Patel (right) celebrating Diwali with her little sister circa 1981. 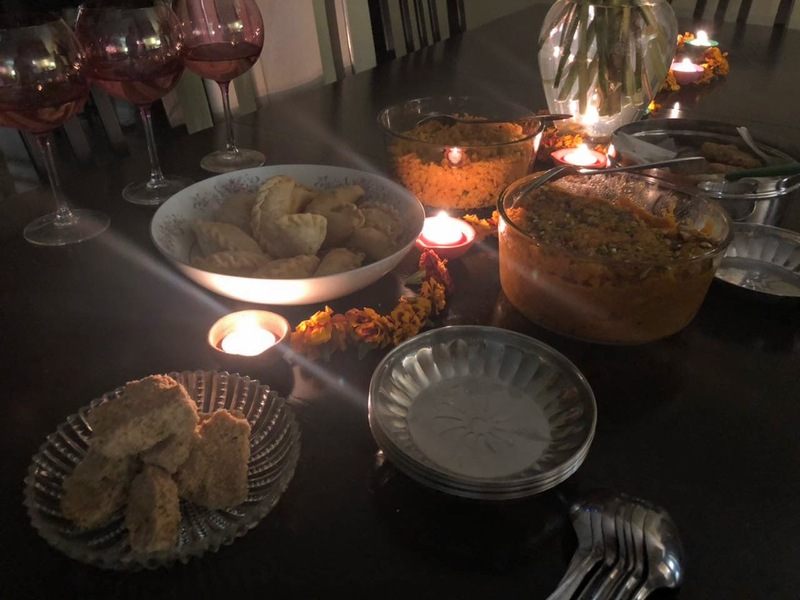 As the temperatures dip and the weather grows dreary, Henna Patel says there is one bright light for her every autumn: Diwali. The dazzling colours, lights, and spicy and sweet aromas that fill her family home is a welcome juxtaposition to the cold and drab fall weather. Each year she says she's transported into a week-long extravaganza. "Even just the music! Like it's a real get-down, you know?!" she says laughing. "It is still the time of year I get most excited about." Patel's family is from the Indian state of Gujarat. Her parents moved to Canada in the early 1970s and settled in Tillsonburg, Ont., a small tobacco farming town, where she and her two siblings were raised. Many of her friends and schoolmates were daughters and sons of farmers of Dutch descent; hers was one of the only Indian families in town, she says. So Diwali — the Hindu festival of lights that's celebrated every autumn in the northern hemisphere — was important to her and her family to connect with their culture. Henna Patel (right) celebrating with family and friends in the home they grew up in, in 1979. "We likely celebrated even more boisterously because we grew up in a small town. My siblings and I have my parents to thank for that. They just love to celebrate, and no amount of effort is ever too much." Patel said her family would drive an hour to attend temple and cultural events. Her mom would work over a stove late at night, making the "most complicated and delicious dishes by hand"; preparing feasts after making the regular family dinners for a growing family of five. And her dad would ensure her mom had the freshest produce for all the dishes, including 10 pounds of carrots her mom would shred by hand to make one specific halwa dish — among the 15 other dishes she would also make. Growing up, she says her father was also adamant that they attended all the festive events, regardless of the day of the week, or how far they were. The annual sweets table at the Patel home. The digital content strategist says that sometimes she and her siblings would perform a musical number at the events, which meant they often wouldn't get back home until midnight. And then back to school again the next day. "That was kind of a surreal feeling growing up — being out, essentially partying until midnight, and then no one at school really knowing about it." Patel adds that Diwali was always in the middle of basketball and cross-country running season. "This meant early morning and after-school practices and games — sometimes showing up with a bit of glitter on my face from our outfits the day before, and trying to explain the henna on my hands to teammates and coaches, who sometimes look confused. Again, small farming town in the '80s!" 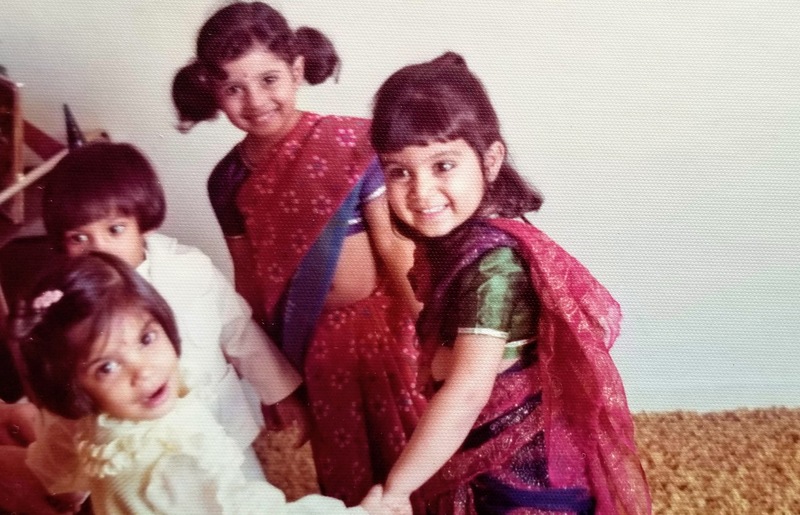 Growing up in a small town, with only a handful of minorities, made it difficult for Patel to feel outwardly connected to her culture and community on a daily basis, she says. "I very much wanted to move around in my day to day like all my friends, but knew every second that I was just fundamentally not like them," she says. "I had this whole other world at home. Yet there was no real way to express that in a public forum most days. It's not like I could walk around school in a sari and high-tops just to be ready for the basketball game after school!" She says even being vegetarian was pretty much unheard of back then. "He was a bit nervous to light the sparkler but ended up loving it," says Henna Patel, who celebrates with her son on his first Diwali. So like many second-genners, Patel would straddle and celebrate two worlds — a fitting paradox in relation to Diwali, which celebrates the dualities of life: triumph of light over dark and the power of good over evil. "We would float between plaid flannel and rock 'n roll to silks, bedazzled bindis and tabla and sitar music at the drop of a hat," she says with a laugh. "It was really empowering to celebrate those parts about you that are barely acknowledged most days of the year." Patel notes that Diwali, like so many Hindu festivals and ceremonies, include moving celebrations of feminine strength and their contribution to life, replete with goddesses and gods, silks and jewels, flowers and offerings, colours and music — a celebration of the things she believes helped shape her. "It's an acknowledgement that beauty of all kinds and power go hand in hand. That you can exist here but have roots in other places," she says. Justin Trudeau Tried To Honor Diwali. Instead He Offended Twitter. "There is deep feeling of being part of something meaningful that crosses geographic and generational boundaries. The world around us doesn't pause, but we can for a few days. The centuries-old cultural and religious ceremonies, generational family recipes, and the communal practice of lighting the diyas together for five nights, it's all identity forming and powerful."